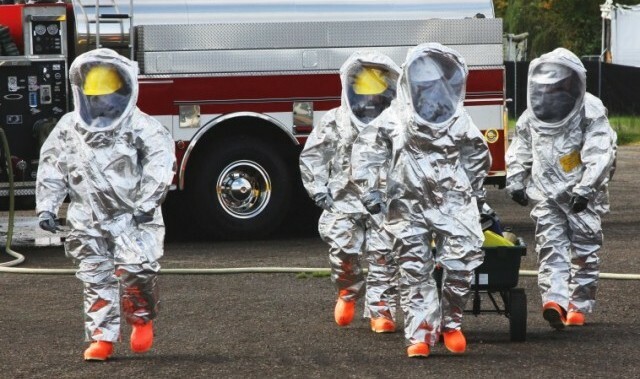 Our OSHA 40 Hour HAZWOPER training helps workers obtain their 40 Hour HAZWOPER certification. Students of this course include general site workers involved in hazardous substance removal or other activities that could expose workers to hazardous substances and health hazards. We offer several alternative OSHA HAZWOPER training courses, including our Online 40 Hour HAZWOPER Training, to help workers meet the 40 Hour HAZWOPER training requirements in the format they prefer. View 40 Hour HAZWOPER Options. This course is provided in a classroom setting at our facilities and is typically scheduled during a 5 day period for 8 hours per day. View the Classroom Training Schedule and 40 Hour HAZWOPER training locations. Our OSHA 40 Hour HAZWOPER Classroom training course is designed for workers who need their 40 Hour HAZWOPER certification, and includes workers involved in hazardous substance removal and activities that could expose them to hazardous substances and various health hazards. General site workers (such as equipment operators, general laborers and supervisory personnel) engaged in hazardous substance removal or other activities which expose or potentially expose workers to hazardous substances and health hazards shall receive a minimum of 40 hours of instruction off the site, and a minimum of three days actual field experience under the direct supervision of a trained experienced supervisor. For information on OSHA HAZWOPER training requirements or the HAZWOPER courses we offer, visit our HAZWOPER Training page. This OSHA 40 Hour training course includes up-to-date, high quality training created with your safety and learning as our top priority. You can enroll in the classroom courses offered at our facilities through open enrollment. This course is typically scheduled during a 5 day period for 8 hours per day. The training will take a minimum of 40 hours to complete. View the 40 Hour HAZWOPER classroom training schedule and 40 Hour HAZWOPER training locations. We can also provide this 40 Hour OSHA training on-site at your location when hosted by your employer. Request a quote for onsite training. 24 and 40 Hr HAZWOPER Training Overview; Introduction and HAZWOPER Overview; Regulatory Overview; Safety and Health Program; Medical Surveillance; Hazardous Materials Recognition and Reference Sources; Toxicology; The Hazard Communication Standard; Physical and Chemical Properties; Site Characterization and Analysis; Site Control; and General Safety Hazards. Personal Protective Equipment (PPE); Respiratory Protection Program; Chemical Protective Clothing; Medical Considerations for Wearing Chemical Protective Clothing; Gas Detection Basics; Sampling Methods and Procedures; Handling Containers and Managing Spills; Decontamination; HAZWOPER Emergency Response; Confined Space Overview; and Introduction to Respiratory Protection. Types of Respiratory Protection; Respirator Selection and Use; Respirator Medical Evaluation; Respirator Fit Testing; Respirator Training and Program Guidelines; Respirator Maintenance and Care; Chemical Protective Clothing (CPC) Overview; Chemical Protective Clothing (CPC) Program; Chemical Protective Clothing (CPC) Selection; Chemical Protective Clothing Classifications. Donning Chemical Protective Clothing; Doffing Chemical Protective Clothing; Decontaminating Chemical Protective Clothing; Inspection Storage and Maintenance of Protective Clothing; Training and Monitoring for CPC; Preventing Sparks; Sensor Technology; Types of Gas Detection Systems; Colorimetric Tubes and Diffusion Tubes; Flammability and CGI’s (Combustible Gas Indicators); PIDs and FIDs; and Other Detection Devices. *Topics covered each day may vary slightly from the above schedule depending on class progress. Once the 40 Hr HAZWOPER course is completed successfully, you will be issued a Fed-OSHA certificate in accordance with 29 CFR 1910.120. You will be given access to download, save or print a 40 Hour HAZWOPER Certificate of Course Completion which is provided in PDF format. Within 24 hours of course completion, you will also be mailed a PVC credit card style Wallet ID Card, with optional photo, showing training course completion.